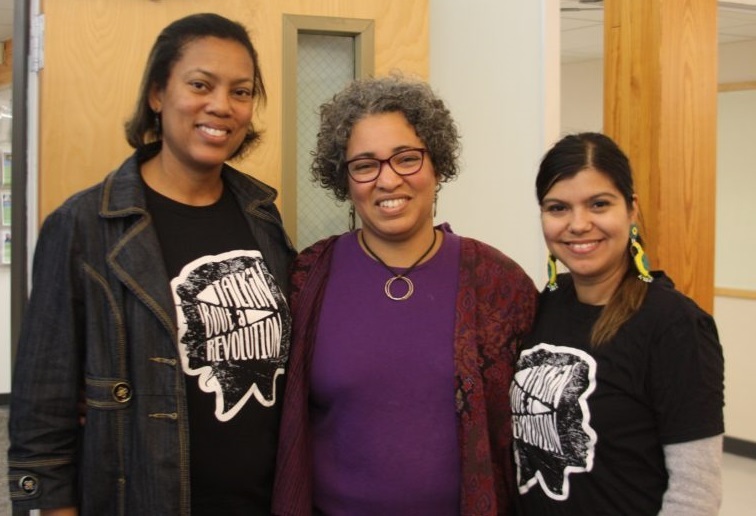 The WDT conference sought to make space for imagining a new world by creating a set of community commitments that invited participants before and throughout the conference to collectively center the margins and create space for those whose voices have historically been on the margins. They were invited to find comfort with discomfort, to bring their whole selves and foster space where others could feel safe enough to be authentic, to name hard things, and to extend grace and space to create healthy boundaries between each other. 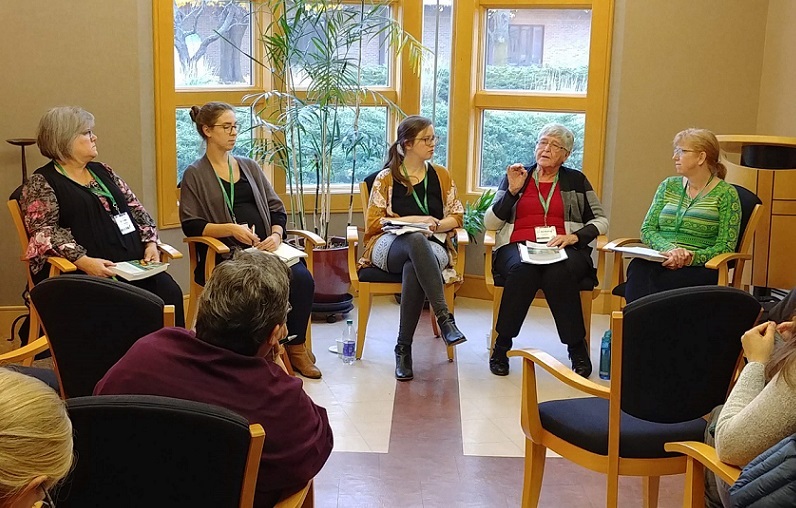 “Women Doing Theology was a beautiful example of what happens when we create space for people to bring their whole selves into a room and vulnerably and carefully offer what they’ve got,” said Jenny Castro, coordinator of MC USA’s Women in Leadership (WIL). The conference was organized by Castro, Chantelle Todman Moore and Melissa Florer-Bixler, members of the WIL Steering Committee. 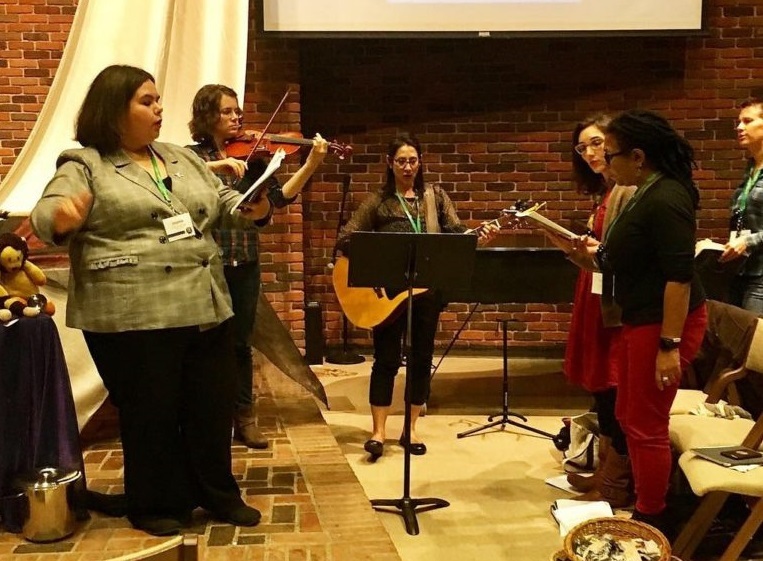 Among the more than 50 workshops and papers presented during breakout sessions, topics ranged from revisiting women in the Bible, to imagining futures of liberation, to song and movement practices. In an attempt to provide safer spaces that could allow people to “bring their whole selves,” autonomous spaces were organized for women of color, Spanish-speakers, queer people and people with disabilities. Whiteness and men’s accountability spaces were also available. In the conference’s first session, Malinda Berry spoke about the theological work of turning the world around through revelation and revolution. She built an “altar of intention” during her talk, adding items including a Bible and stuffed animals to symbolize ideas that have been central to her understanding of this work, including nonviolent communication, The Circle Way and intersectionality. Berry described “revelation” as a point of communication where theological speech begins. “This gap between the way that God wants the world to be and the way the world is, is revelation,” she said. “I am here to issue a prophetic call that it is time to shout from the margins,” said Rev. Yvette Blair, a womanist preacher and co-founder of The Gathering: A Womanist Church in Dallas, Texas, and the speaker in the second large group session. She encouraged the audience to use their “outside voices” as a way to show up and speak out against racist and patriarchal structures. “It is in the margins where fruitful ministry occurs,” she said, describing that some leaders have used Christianity as a tool of oppression. “The church—the one that has historically been an agent for social justice—is either suffering from spiritual laryngitis or is benefitting from the status quo,” Blair said. She challenged the group to question who the marginalized are among them. Carolina Hinojosa-Cisneros, a Tejana poet, writer and speaker, introduced theopoetics as the language of liberation in the third large group session. She traced the beginnings of poetry back to Enheduanna, a Sumerian woman and the first known poet in the world, pointing out that women, black and indigenous people have been doing theopoetics long before the term was coined in 1971. Hinojosa-Cisneros shared several poems in English and Spanish by Central American poets. Worship sessions throughout the conference included music, scripture, poetry, communion, sound and meditation, inviting attendees into several ways of experiencing God’s Spirit at work. 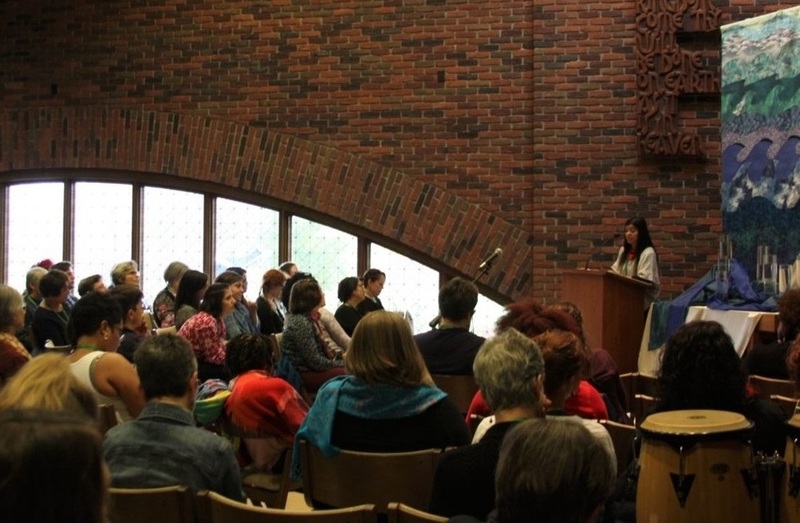 During the final worship session, four readers took turns calling the names of women into the space, beginning with biblical women like Hagar and the unnamed women who came with Jesus to Galilee, then prominent historical women like Sojourner Truth and Dorothy Day. They continued by naming every person in attendance at the conference. In this large group session, Berry, Blair and Hinojosa-Cisneros explored the importance of community and lament, answered questions from the audience and expressed gratitude for the space created by WDT.